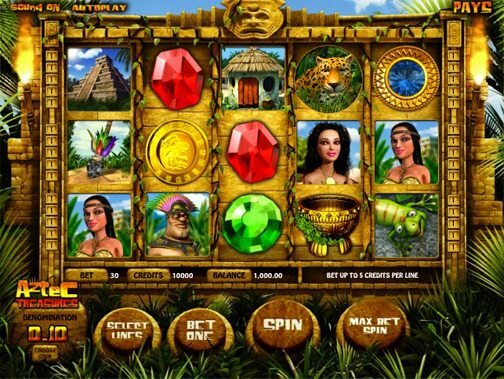 Aztec Treasures is a 5 reel slot machine with an Aztec theme, featuring two bonus rounds, free spins, wild symbols and more. The game has five spinning reels and 20 pay lines. Simply choose your bet amount, and press the spin button. You can bet between one to 150 coins per spin, and the coins range from two cents to $1. Therefore, you can play for as little as two pennies a spin or as much as $150. This slot game boasts a number of special features, including a Kiss Me wild reel, Spear Toss random wilds, a Gecko free spins mode, an on-the-reels click-me bonus named Calendar Symbol, a Secret Treasure Vault second-screen bonus, and a Love Hut second-screen bonus. Play Aztec Treasures slot for fun below! Receive a $22 No Deposit Bonus at Slots.LV! If the player lands on 3, 4 or 5 scattered Idol symbols they automatically win 5, 15 or 20 Free Games, respectively. Every time a scatter symbol appears while playing a free game, the player receives a bonus equal to the triggering bet. Getting 1, 2, 3, 4 or 5 scatters awards 1, 2, 5, 15 or 25 additional free games, respectively. All prizes won during a free game are tripled except for the bonus. Autoplay spins are played at the last game’s bet and line selection. The Autoplay feature ends when Stop Auto is clicked or the account balance reaches zero. The Aztec King appears only on reels 2, 3 and 4 and substitutes for all other symbols except scatters. The random progressive jackpot can be won at the end of any game. It is paid out no matter which denomination the player bets and is added to other wins. Bet & Spin Settings – Allows players to change all bet parameters by using the sliding controls. Players can play from 1 to 20 lines. The default for the game is 20 lines. Players must play lines sequentially (1, 2, 3, 4, etc.) and are not able to choose lines out of sequence (4, 16, 9, 20, etc.). “Bet per Line” allows players to increase or decrease the bet per line/per game. Players can bet $0.01, $0.02, $0.05, $0.10, $0.25, $0.50, $1.00 and $5.00 per line. The third option, “Auto Spin”, activates up to 25 continuous spins. Players can choose the amount of auto spins and can stop “Auto Spin” by setting it to 0. All symbols pay from left-to-right, except for scattered Idols, which pay any way.